1. Fill a clean jar with sugar. 2. Split open a vanilla bean and scrape the seeds into the sugar in the jar. Mix. 3. Bury the vanilla bean in the sugar as well. 4. Seal the jar tightly and keep in a cool, dark place for at least 1 week until the sugar absorbs the vanilla fragrance. 1. 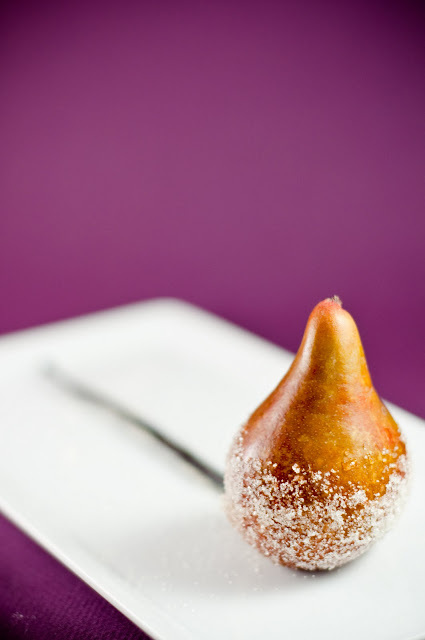 Dip the bottom half of a whole Seckel pear into dry white wine. 2. 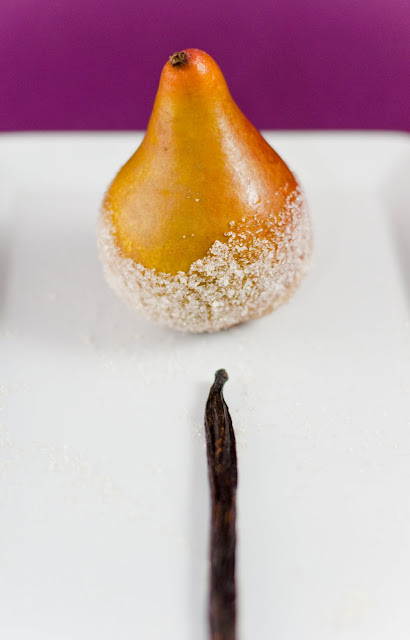 While still wet, dip the bottom half of the same pear into vanilla sugar. Shake off excess sugar. Keep the extra vanilla sugar in the jar (with the vanilla bean) for other baking or cooking purposes! It's a great ingredient to have on hand. Also, if you want the pears to keep their sugar a bit longer (i.e., if you're not serving immediately), substitute the white wine with pasteurized egg whites. But, it just doesn't taste quite as good without that mild whiff of wine. Love the pictures! It looks delicious and easy!